Did the Mahmoody family really have a house on the water in Alpena, Michigan? Was Betty’s dad really ill? What was the state of Iran at that time? Were Moody, Mahtob and Betty really greeted by so many family members upon arrival in Tehran? Was Betty given a gift from Ameh Bozorg upon arrival? Was an animal sacrificed in their honor? Did Betty Mahmoody really get stopped by the pasdar for showing her hair in public? Was Betty really told that the passports needed to be approved three days prior to leaving the country? Yes. Mammal told her that the passports had to be taken to the airport three days before departure for approval. However, later, when Betty was supposed to go visit her father, they took the passports to the airline two days in advance but only to hold for safe keeping, not for approval. This draws into question whether the three day waiting period was actually required or was a tactic used by the family to keep Betty from leaving Iran. Did Moody tell Betty that they would only be in Iran for a two week visit? This depends on who you ask. Betty Mahmoody claims she was told from the beginning that it would only be a two week visit to see her husband's family in Tehran. Sayyed Bozorg ‘Moody’ Mahmoody claims that they went so he could help those injured in the war and she knew that they would be staying there. Was Moody really picked on by other doctors? Is it true that if a woman marries an Iranian man, the wife is automatically an Iranian citizen? Did they really stay with his sister Ameh Bozorg? Where did they move to when they left Ameh Bozorg’s? Did his family really keep a watchful eye on her? Did they really celebrate Christmas in Iran? Did the owner of a menswear store let Betty use his phone? Did the owner of the men’s store introduce her to the person that helped her escape? Did Moody really lock Betty in their home and take Mahtob away for weeks? Did Betty Mahmoody really meet an American woman in Koran class? Did she ask Ellen to mail a letter for her? Did Moody really have trouble getting a job in Iran? Was Mahtob Mahmoody really sent home from school because she was crying so much? Did Betty really just sit around in the school office all day reading? Were they at school when the bombing occurred? Were basketball players really taken away in trucks? Was the original plan to escape through Turkey? 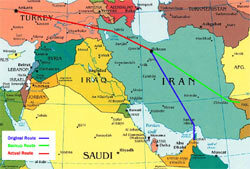 Escape Routes from Iran (click to enlarge). Did Betty and Mahtob really escape when Moody was called to an emergency? Did Betty say she wanted to buy gifts for her father in order to get out of the house and escape? Was the heat and wind an issue during the escape? Was she really almost raped when trying to escape? How long were Betty and Mahtob Mahmoody in Iran? Has Moody seen his daughter Mahtob since she fled from Iran? No. Despite trying to call and e-mail Mahtob, Sayyed Bozorg ‘Moody’ Mahmoody did not see her again before he died on August 23, 2009. She refused contact with him. The last time they were together was January 29, 1986. What does Betty Mahmoody do today? Watch interviews and video exploring the Not Without My Daughter true story. Watch an interview with the real Betty Mahmoody and then view each segment of a 2002 Finnish documentary film that offers Sayyed Bozorg Mahmoody's side of the story. This video features footage of Betty Mahmoody, author of Not Without My Daughter, being interviewed in 1991 around the time of the movie's release. Part 1 of a 2002 documentary told from Sayyed Bozorg Mahmoody's point of view. In the film, he explains that he was the one done the injustice when his wife Betty kidnapped their daughter and fled Iran. In this segment, Sayyed tries to phone his daughter Mahtob but instead hears Betty's voice on the answering machine. Part 2 of the documentary Without My Daughter. In this segment, a former friend of Betty's, who still lives in Iran, says that Betty's husband Sayyed "was giving permission for Betty to leave" the house. Part 3 of the Finnish documentary defending Sayyed Bozorg Mahmoody's point of view. Sayyed claims that the real story is that he, being an anesthesiologist, returned to his country to help those injured in the war between Iran and Iraq. Watch part 4 of the documentary film. Here, we see Sayyed try to phone his daughter again from his home in Tehran, Iran. Sayyed shows us his passport and departs for Finland, a place that he feels is neutral ground where he and Mahtob can meet. Part 5 of the Without My Daughter documentary. A Michigan judge is interviewed and Sayyed contacts the American Embassy in Helsinki, Finland and he is told that he must return to Iran to attempt to obtain a visa. Sayyed pleads with the woman at the embassy to help him reach his daughter. In the final segment of the documentary, Sayyed reflects on his efforts to contact his daughter Mahtob and he thanks the filmmakers for their assistance.